The soil has been fertile for planting poetry this month. 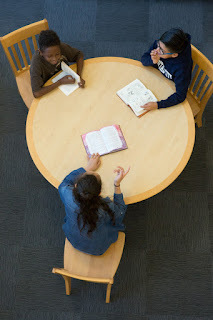 At the beginning of March, Nikki Grimes challenged us to write golden shovel poems inspired by striking lines from "Black Box" from BRONX MASQUERADE, "blurred lines" by Lil Fijjii, and "Truth" from BETWEEN THE LINES. 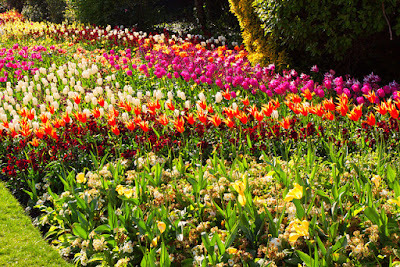 Many gardeners' hands and hearts have made for a glorious and thought-provoking array of poems—some introspective, others proactive, but each one transplanting a line of poetry and sprouting new life. 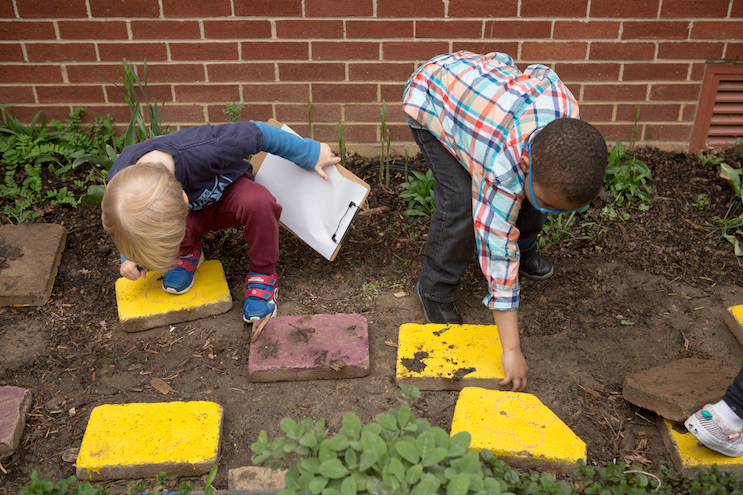 THANK YOU to everyone who wrote golden shovel poems for our community garden, and most especially to Nikki Grimes for the seeds of inspiration that led to such fruitful results. Scroll through the poems below or, for best viewing, CLICK HERE. If you would like to add your golden shovel to the collection, post it on our March 2018 padlet by March 31st and I will add it to the wrap-up presentation. Alternatively, you may enter the giveaway by commenting below. Comments must be received by Tuesday, April 3, 2018. If you contribute a poem and comment below you will receive two entries in total. The winner will be determined by Random.org and announced next Friday when we reveal next month's interview and ditty challenge. Good luck! 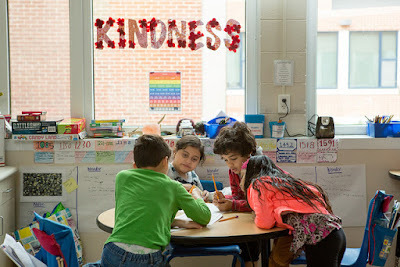 Due to the popularity of my March 8th "Teacher Tips" post, I've created a downloadable and printable document for convenient use during National Poetry Month. Download or print your copy HERE. Heidi Mordhorst is hosting the Poetry Friday roundup at my juicy little universe. Find out more about Irene Latham's annual Kidlitosphere Progressive Poem (making the rounds beginning on Sunday, April 1st) and check out the many links to this week's other poetry offerings. ~with a line from "Truth, by Tyrone Bittings"
is you must give your heart to me. © 2018 Doraine Bennett. All rights reserved. "Truth, by Tyrone Bittings" © 2018 Nikki Grimes, from BETWEEN THE LINES. Click HERE to read this month's interview with Nikki Grimes. She has challenged us to write a golden shovel poem using a line from one of the poems in the post. and I wield great power― hurt harm or heal. How will we choose? go." but the world weighs in and i can't turn my back. © 2018 Heidi Mordhorst. All rights reserved. bloom! Then pump fists and shout! © 2018 Karen Eastlund. All rights reserved. sorry. I know that you're tired. what you will, I probably won't believe it. matters as long as you come back. Click HERE to read this month's interview with Nikki Grimes. She's challenged us to write a golden shovel poem using a line from one of the poems in that post. Other poems featured this week included work by Ann Magee, Jone Rush MacCulloch, Maria Marshall, and Sydney O'Neill. 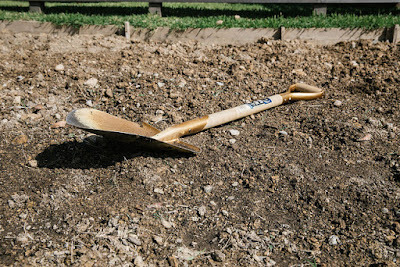 Margaret Simon's students wrote golden shovel poems (also inspired by "blurred lines") which she shares today at Reflections on the Teche, and Rebecca Herzog shares her golden shovel at sloth reads. 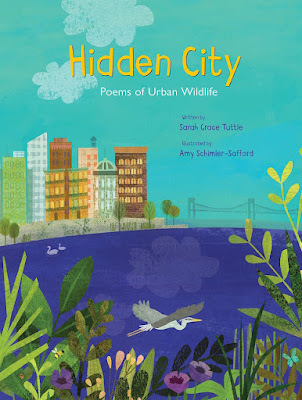 The winner of last week's giveaway for a personalized copy of Hidden City: Poems of Urban Wildlife by Sarah Grace Tuttle, illustrated by Amy Schimler-Safford is . . .
and helps to find a thought that’s clear. © 2018 Sydney O'Neill. All rights reserved. ~with a line from "Black Box, by Devon Hope"
All that remains is I.
come true. And futures too big to fit. refusing to walk in fear? © 2018 Jone Rush MacCulloch. All rights reserved. tick-tick-ticking. Look up. Walk forward. My hand is always at your back. © 2018 Ann Magee. All rights reserved. In my blogging life, there are few things that give me as much satisfaction as being able to introduce a poet from one of The Best of Today's Little Ditty collections as a DEBUT AUTHOR. Although Sarah Grace Tuttle hails from Boston, we never crossed paths while I lived there. My connection with her is one of those "small world" stories—a close friend of mine told me about a woman named Sarah who writes poetry in her critique group. Not long after, I started noticing Sarah Grace Tuttle's name pop up in Poetry Friday roundups, and, well, here we are! On her website, Sarah describes how, thanks to her Nana, her first stories were recorded before she was even able to write. She also describes her lifelong fascination with the natural world. Unwilling to choose one interest over the other in college, she ended up earning degrees in both Environmental Studies and English, followed by an MFA in Writing for Children. Find at Amazon.com, Barnes & Noble, & Indiebound.org. 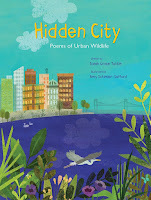 Hidden City: Poems of Urban Wildlife (Eerdmans Books for Young Readers, 2018) is the result of Sarah's two passions coming together to create a book that's graceful and eye-opening—the perfect blend of poetry and science. 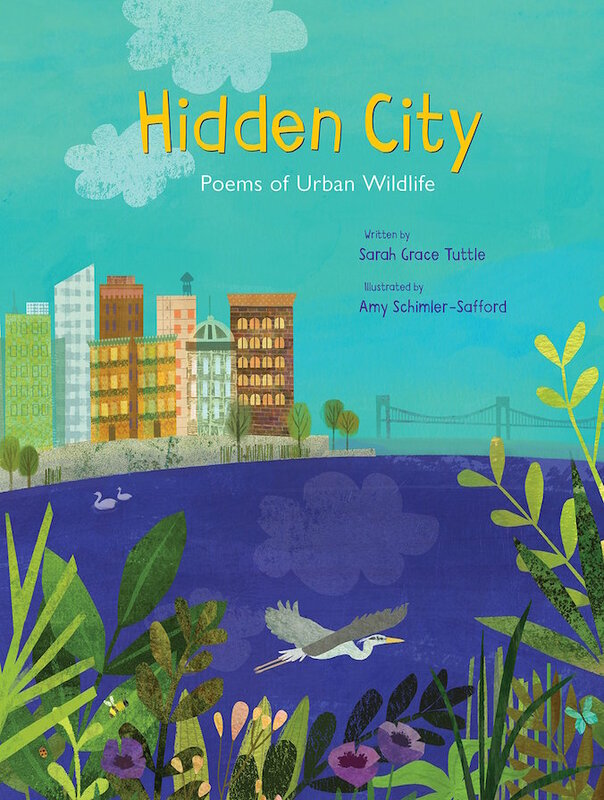 Twenty-eight pared-down, lyrical poems celebrate the urban wildlife that captivated Sarah as a young child, from house mice to feral cats, dandelions to elm trees, and shadowy spiders to roof top falcons. 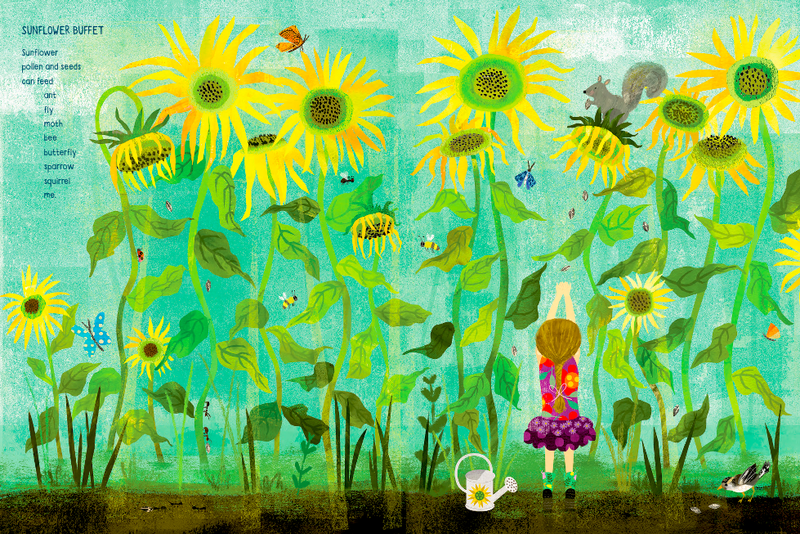 Coupled with Amy Schimler-Safford's richly colored collage illustrations, this collection also happens to be gorgeous! 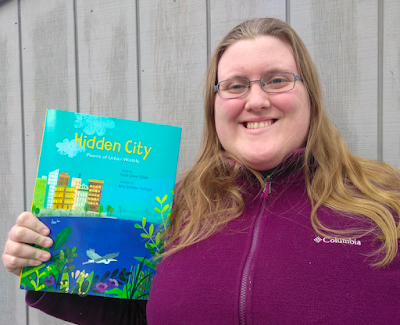 While marketed for young children (have a look at the adorable book trailer), Hidden City will be enjoyed by anyone who is enchanted by nature. Whether it's pigeon pageantry, ants waging war on the sidewalk, moss carried by a shoe, or a cricket singing to his mate in a heating vent, the hidden lives of plants and animals are unveiled in surprising and imaginative episodes that dazzle and pop off the page. From Hidden City: Poems of Urban Wildlife (Eerdmans, 2018). 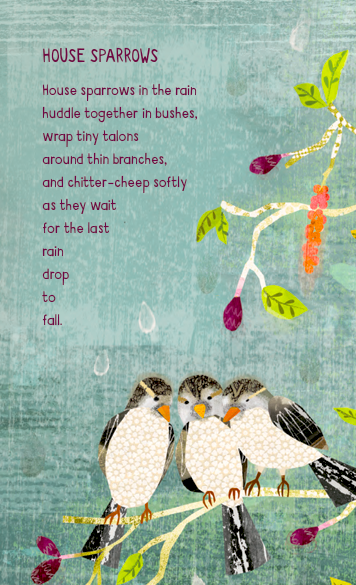 Text © Sarah Grace Tuttle; illustrations © Amy Schimler-Safford. A "hidden" benefit of Hidden City is that it subtly reminds readers to notice and care about the environment—the flora and fauna that share our corners of the world. You'll find additional fun and unusual facts about the wildlife featured in these poems at the back of the book, as well as suggestions for further reading. And speaking of further reading, do be on the lookout for another book from Sarah coming this fall! It's a board book from Creative Editions called Dot, Stripe, Squiggle. Also inspired by nature, it introduces the extraordinary patterns displayed in living things by featuring dotted, striped, and squiggly sea creatures. For today, however, I've invited Sarah to come and talk about the inspiration for one of her poems from Hidden City. 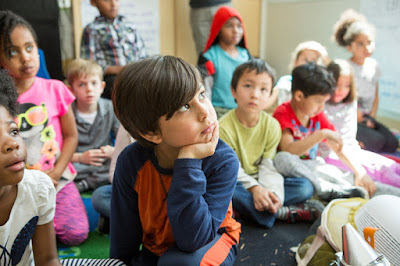 And because we're focusing on poetry in the classroom this month at Today's Little Ditty, she has a wonderful educational activity to offer as well! Thanks so much for being with us, Sarah. Thank you so much Michelle for hosting me today and featuring Hidden City: Poems of Urban Wildlife. Happy Poetry Friday! Hidden City was born from my life-long love of nature in the city. As a child, dandelions were my favorite wildflowers. Pigeons were endlessly fascinating, and rabbit tracks on the sidewalk were a special find on a winter day. As an adult, I wanted to create a book for the kids like I was—the city kids who love the wildlife right in their own backyard, and the ones who would love it if given the chance. Many of the poems in Hidden City are based on moments of observing wildlife or questions about what I saw that I had as a young person. They are also science poems, designed to quietly teach readers about what they are seeing as they look around their neighborhoods and backyards. “Sunflower Buffet” is a list poem inspired by a tall stand of sunflowers I walked by every day when coming home from school. illustrations © Amy Schimler-Safford. Click image to enlarge. I always saw so many animals in and around the flowers! Many of the animals I included in the poem are ones I observed on those walks. As a science writer, I also created this poem as a way to introduce an underlying concept of food webs—how one species can feed many others. A sunflower provides so much more than food, but focusing the poem on this single ecological function allowed me to both educate and have some fun. List poems are a great way to start teaching the observation skills that an ecologist or wildlife scientist relies on in the field. 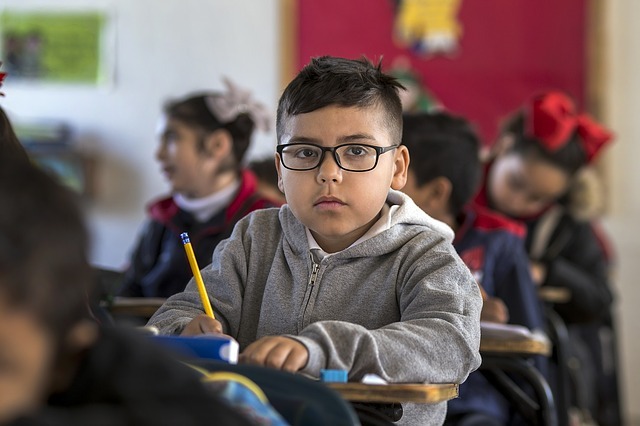 Here is an observation list poem activity that you can take and adjust to the needs of your group of young writers. Take your writers to an outdoor place—the schoolyard, a local park, or even a side street with a few trees on it. Have them pick something natural to focus on—it can be anything, so long as it’s not man-made! Maybe they spot an ant in a sidewalk crack, or focus on a tree, bird, cloud, or flower in a garden. Have them list at least 10 things (fewer for very young children) that they notice about what they are observing. Their list can be single words or multi-word phrases, but it must be something they actually observe that day. Encourage them to be as specific as they can. 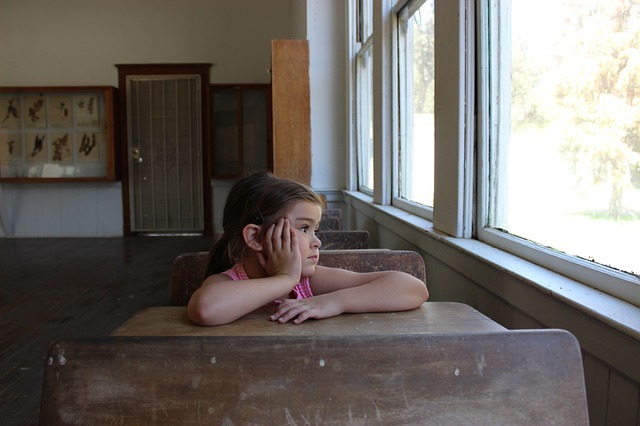 For very young children, the list they made outside can be their poem. Have the title of the poem be what they observed. 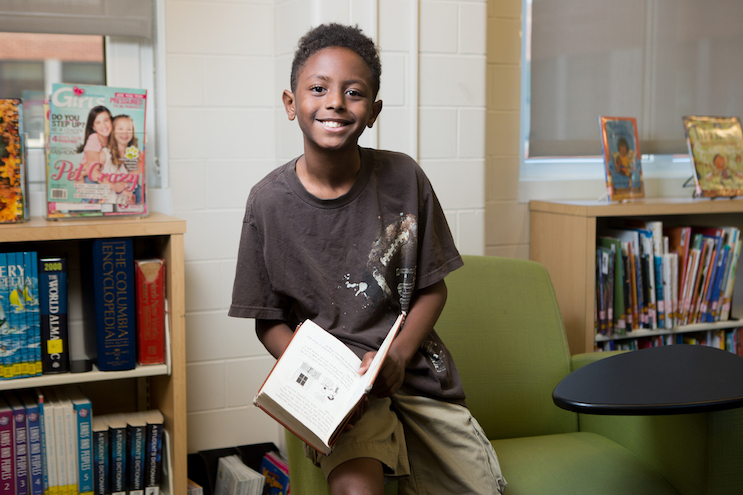 For older children, have your writers pick at least six of the things on their list and arrange them into a poem. They can choose the order of their items any way they want (alphabetical, chronological, spatial, or even just what sounds good), but there should only be one item per line. Have them add another line or two to the poem about what they observed. 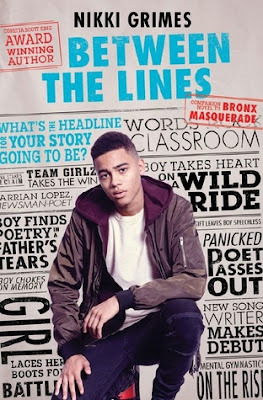 Suggestions: If they are adding lines at the beginning of the poem, have them use the lines to introduce their subject. (For example: “A lone tree on the sidewalk…” ) If they are adding lines at the end of the poem, have them use the lines to draw some sort of conclusion about what they observed. (For example: “… a tree is a busy place!”) I find these extra lines are always fun to read. You never know what a child will come up with! 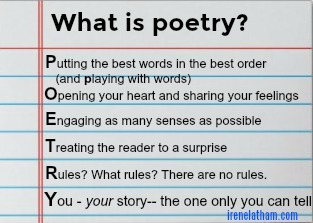 What an excellent way to bring poetry into the classroom. Would you like to get your hands on a copy for your home or school library? 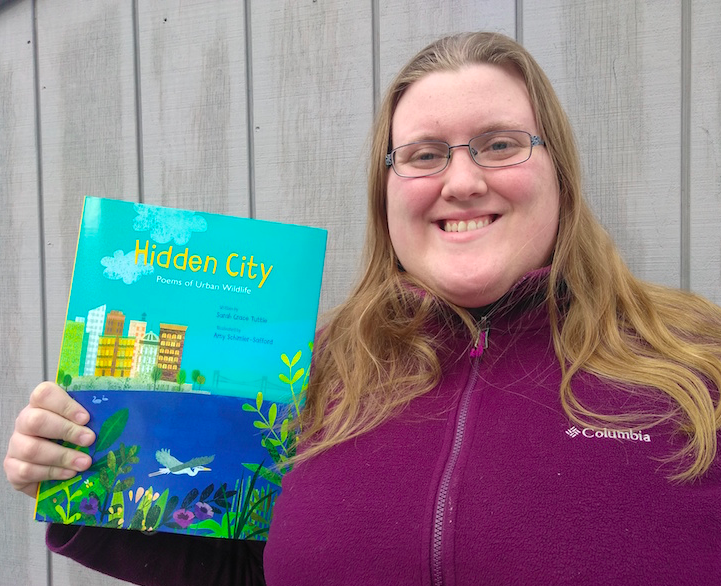 Sarah has graciously offered a personalized copy of Hidden City: Poems of Urban Wildlife to one lucky Today's Little Ditty reader. To be eligible, all you need to do is leave a comment below or send an email to TodaysLittleDitty (at) gmail (dot) com with the subject "HIDDEN CITY GIVEAWAY." You have until Wednesday, March 21, 2018. The winner will be selected randomly and announced on Friday, March 23rd. In addition, Sarah is running another giveaway at her website that is specifically for teachers—an opportunity to win one of three classroom visits. (In person if your school is within the extended Boston area, or a virtual visit if it is not.) 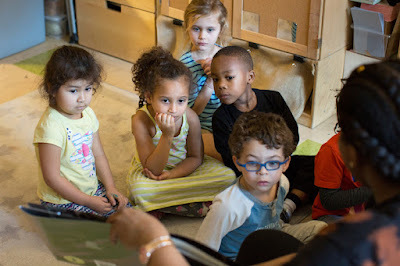 Click HERE for more information about the classroom visit giveaway. Thank you to everyone who has been leaving golden shovel poems on our March 2018 padlet. We've got quite a variety there already, but there's always room for more! 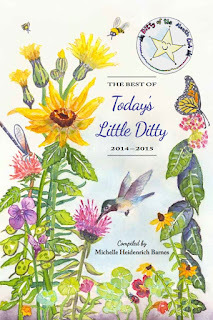 This week's featured poems at Today's Little Ditty were by Brenda Davis Harsham, Janice Scully, Sherry Howard, and Cindy Breedlove. Jone Rush MacCulloch featured a golden shovel this week at Deo Writer. Mary Lee Hahn, Catherine Flynn, and Michelle Kogan are all featuring golden shovel poems at their blogs today. Lovely Linda Baie is our host this week for the Poetry Friday roundup. 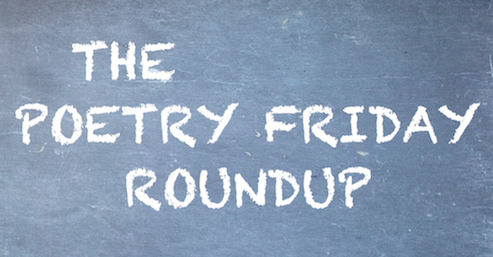 You'll find all the poetry goodies over at TeacherDance. and live now, this moment, this instant. There will be no replay. © 2018 Cindy Breedlove. All rights reserved. risk at the end of the day. escaping dark forces with my house on my back. feel incomplete. For money. My dreams aren’t found in your boxes.